The weaver comes from a dark place but he was born a hero, he has come back to re-weave memories and to re-weave the city. The work is an independent continuation of the piece Return of the Weaver part I (a school drama). 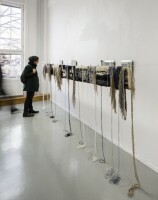 The title of the work refers to the video game LOOM. The question ¨what is an image?¨ is important to me. In weaving, image and material are the same thing; without a warp and a weft, no image. The thread is the image. Thread plus thread become meaning. The image is a scaffold of thread. The practical work is accounted for. The work is an installation. The weave of the work can be regarded as a fragmentary chronicle, a skyline of a, partly imaginary, Tensta, where I was born 1982 and lived until 1987. I borrow the hero Bobbin from the video game LOOM, to look back at that time with more experienced hands. The chronicle is woven in wool on a linen warp, the technique is rya. The information is woven in, image and text are developed through different heights of the rya knots, and the exposure of both the front and the back.